Bar Depth: 1" Bar Length: 4.5"
"Spaceship Mold with Alien Toy Embed"
COMMENTS: Adults who love the show Ancient Aliens just adore the soaps I made for them with the alien embeds. So cute. 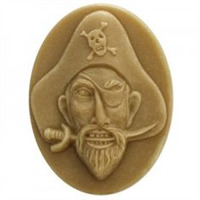 • Makes such cute soaps. COMMENTS: The spaceships are a big seller! I use the clear crafters choice and add crafters choice glitter! I didn't have any issues unmolding. COMMENTS: I love these for my kids' line. Add blue or glow in the dark aliens and they are ready to go. COMMENTS: These made super cute ufo soaps for a ufo festival. Bought one and I'm back for the 5 pack. 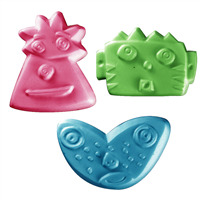 COMMENTS: These are really fun soaps for the kiddos. The ufos are a bit smaller than the rockets. 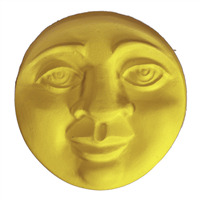 A little difficult to release from the molds. COMMENTS: This is so cute, I wish you carried the little aliens to embed in the soap. 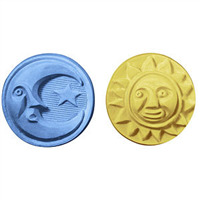 "Is it possible to use those molds for bath bombs (like you would a silicone mold)? How many ships are in a single mold?" Staff Answer Yes, you can use a plastic Milky Way mold for bath bombs. There are 4 cavities on a mold, 2 of each design shown. Staff Answer The maximum temperature for this mold is 135-145°F. Therefore I do not feel that this mold can withstand the high temperatures reached during the CP soaping process. Yes, they can! I've been loving them. I have used them successfully. I just don't insulate so it doesn't go through gel phase. I leave it in the freezer for a few days to pop them out of the mold.